My car experience has, on last count, introduced me to forty different cars over the last thirty years. That is, counting cars that I have learned to know by driving at least 1000kms, or more in succession. My journey has taken me around 1.2 million kilometres. 400,000kms of those driven in Europe, 600,000kms in Australia and 200,000kms on motorbikes, from Australian outback tracks to Autobahns in Germany. From stop-start grid locked roads to top speeds of 250Km/h, some for pleasure and some out of necessity. The pleasure of driving has not diminished over all these years. Looking back on the cars that I have owned makes me think about the choices one makes when choosing a car. Was it budget, performance, prestige, pragmatism, idealism, or a phase in one’s life that led to one car or another? My first car in 1977 was a 1975 Alfa Sud Ti. It was bought second hand for around for $3000, which was good value at the time. It was mechanically sound, but prone to corrosion. My second car in 1978 was a 1975 Alfa Romeo Giulia Super 1600. It remains an icon in Alfa Romeo circles and still has a special place in my heart. My third car in 1980 was an Alfa Romeo 1977 GTV 1800 with the engine in front and the gearbox on the rear axle. This provided a 50/50 front-rear weight balance and was a beautiful car to drive. In 1981, I became interested in classic cars and restored a 1965 Mercedes Benz 230SL (Pagoda). This is possibly the finest and most noble car that I have owned and is still a classic today. Because of the European winter, I drove this car only in summer and maintained a “winter car”. My “winter car” was a 1968 Renault R4. Yes, the one with the “umbrella” gear stick coming out of the dashboard. It was the simplicity of this rugged little car that made it so endearing. Despite its age, regardless what was thrown at it, it never gave up. By the mid 1980’s, I had my performance and prestige car fix and I completely turned against the trend. Long before the advent of SUV’s, In 1984 I chose a short wheel base Land Rover Series 2A, 2.4 litre 4 cylinder petrol, 60 horsepower, it was auctioned off by the British Rhine Army. Built in 1963 and with only 5000 kms on the clock, no door locks, a soft top and sliding windows, it became my most reliable and treasured transport until I came to Australia. Over this period of time, I clocked up another 60,000kms. From 1987, my car journey in Australia consisted of 20 years of company cars and generations of Ford Falcons. Not very exciting. At least they had rear wheel drive and plenty of cruising power. Pure pragmatism. For the ultimate experience of freedom and individualism I always had a motorcycle. Currently I have a mandarine coloured BMW R1150GS. Motorcycles have been my recreational transport of choice. There is nothing like touring with a motorcycle on a winding and remote country road. The reason why I bought this model is because it is an excellent tourer, has off road capability and a 210kg payload. On one trip in 2004, we (my partner/wife) took the bike on a two week 6000km’s journey across Australia from Darwin to Melbourne. We packed the bike in a crate and shipped it to Darwin to ride it back via Kakadu, Katherine, Tennent Creek, Alice Springs, Uluru, Coober Peedy, Port Augusta, and Mildura. On another journey with friends from Australia, we organised a two week trip to Germany and hired the same BMW motorbikes in Munich. From Munich we travelled about 4000kms over the German, Austrian, and Italian Alps to Tuscany and back. On the trip we experienced alpine passes covered in snow at 2500 metre altitude and fast Autobahn transfers in 30 degree celsius midday sun. The main reason why I like BMW GS model bikes is because of their long distance capability, shaft drive, fit, finish, and build quality. I would rate BMW the benchmark for motorbikes for my specific needs and rate BMW 10 out of 10 when compared to other motorbikes. Australia is twenty times the land area of Germany. Germany has four times the population of Australia. Germany has twice the amount of sealed roads compared to Australia. In Germany, sections of Autobahn without speed limit exist where speeds of 250Km/h or more are possible. What is it like to drive at 250Km/h, you ask? It takes a lot of concentration. The focus and concentration is on what is going on in the traffic ahead. Remember, the distance to be held to the car in front at 250Km/h is at least 125 meters. The danger is that slower drivers misjudge the speed with which others approach. In reality these speeds are not common. The sections of Autobahn allowing these speeds are rare and the opportunity to drive at these speeds is becoming rarer and very few people do so. Generally, speeds of 130-160Km/h are more realistic. German Autobahns are of premium quality when compared to other roads around the world. To negotiate these speeds safely, the cars in Germany are subject to stringent roadworthy inspections and the general driver discipline is above international average. Germany has one of the lowest fatality rates in Europe, with statistics indicating that Autobahnen contribute to the reduction in the road toll through their design. Despite the safety features speed limits of 100km/h apply to German Autobahnen in and around high density population centres. In comparison, Australian interstate and country roads pose a greater risk of head on collisions and driver fatigue due to the extreme distances that need to be covered. The Eastlink in Melbourne, for its specific purpose in carrying heavy traffic loads around Melbourne, would rate 10 out of 10 and is not intended to carry traffic at greater speeds. To date I have been involved in one serious accident. In fact, a single-car accident. It happened in Germany in 1980 on a German Autobahn. It was meant to be a holiday trip and I had about 1000Km’s ahead of me. I left at 04:00 am and by 06:00am I found myself in the barriers with my friend. Lesson learned: Do not fight the inner body clock and do not drive by the clock. Avoid driving in the early morning hours. The car, a 1977 Mercedes Benz 200/8 was a write off. Nobody was hurt. A credit to the design of the car and continuous safety barriers on both sides of the road on German Autobahnen. My company car era in Australia is slowly coming to an end this year and I have to think about what I am going to drive and where my priorities lie. What I would like to drive is a BMW 135i or a Range Rover Sport V8 diesel. But neither car is what I need in the next 10 years. The vehicle is highly off-road capable, and compact enough to be containerised and shipped overseas for my future travelling around the world. The vehicle is designed for driving and living for extended periods in remote locations. It will allow my wife and me the independence and ability to visit iconic destinations in Australia and around the world. Until then I’ll be driving a 1987 Toyota Corolla and a Toyota RAV. Overtaking vehicles - When following and planning to overtake slower vehicles, there is no gain in tailgating the vehicle in front. Staying back provides better vision ahead and at the same time gives room for a run up to gain speed. This helps reduce the time it takes to overtake to a minimum, and turns the process into a safer and less erratic manoeuvre. Uwe trained to drive heavy rigid driving trucks at the age of 21. Note: I first met Uwe in late 2009 and we completed the newsletter in 2010. Born: Germany and lived In Dusseldorf until 1987. Migration: Came to Australia because of the opportunities and freedom. Status: Married. Resides: Eastern suburbs, Melbourne, Victoria. 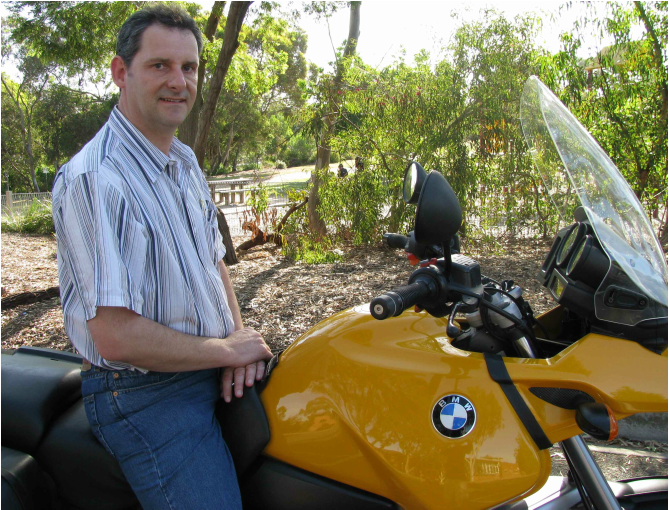 Interests: Motorcycle touring, Travelling, Expedition vehicles, food and wine appreciation. Other cars owned or driven: 1977 Alfa Romeo GTV 1800, 1980 Mercedes Benz 450 SE, 1977 M. Benz 220D/8, 1963 Land Rover series 2A SWB, 1990 Audi 100, 2004 VW Golf. HG Holden Premier, 2008 Toyota Kluger, 1965 Mercedes Benz 230SL (Pagoda). Profession: Mechanical Engineering & Business Management. 30 years in hydraulics and filtration. Tech. Manager. Education: Mechanical Engineering Degree / Germany, Fitter and Turner by trade, Business. Company: International firm specialised in engines and filtration. Dream car: BMW 135i Coupe because of performance, balance, handling, style and value, Range Rover Sport V8d, because it’s a great tourer. Classic car: An Aston Martin DB 5. Dream bike: BMW R1200GS – a balanced all rounder, I rate it 10 out of 10. Purchase: Placed an order for an all terrain expedition vehicle based on Mitsubishi Fuso 4x4. Earthcruiser Manager: Michael / Production Mnager, states the vehicle offers total independence and unmatched off-road ability. The Earthcruiser is based on the Mitsubishi 4 x 4 Fuso Canter which is sold around the world and can be serviced in many remote locations. 19 Earthcruisers have been built in 2011, with customers coming from Europe and the US. The customers age group varies from over thirty to retirement age. The short wheel base model starts from over $200,000 and the Earthcruiser can fit into a shipping container to travel around the world. The last two Earthcruiser photos are from Lance, Manager at Earthcruiser.